This interactive presentation contains the latest oil & gas production data from 19217 horizontal wells in the Eagle Ford region (TRRC districts 1-4), that started producing since 2010, through June 2017. Oil production in the Eagle Ford appears to have slowed significantly during the 2nd quarter, although part of this decline will disappear once revisions are in. Gas production has remained more balanced in the first half of 2017, at ~5.3 Bcf/d. As can be seen in the “Well status” tab, the level of new well completions has hovered around 100 wells per month in the past 1.5 years. 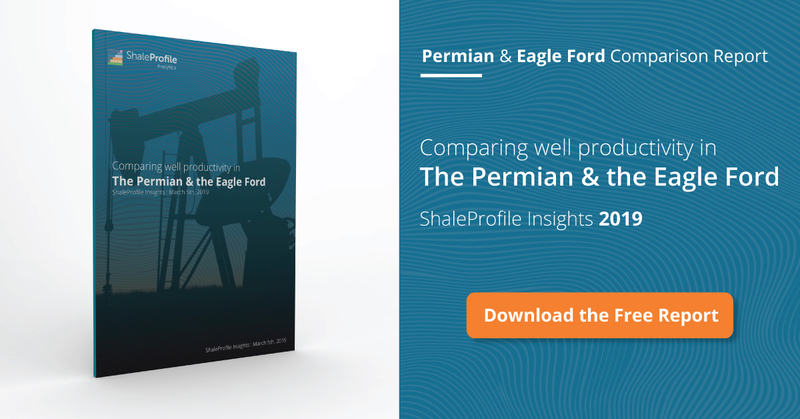 The bottom graph in that overview gives an indication of the ‘ageing’ of the Eagle Ford; in June the percentage of horizontal wells that was producing below 50 bo/d climbed to almost 74% (it was below 40% in the early years of this play). In this “Ultimate Recovery” overview the relationship between production rates, and cumulative production is revealed. Wells that started production in 2014 peaked at a monthly rate of 400 bo/d, and are now just above 50 bo/d, with cumulative production of 133 kbo. Although 2016 wells peaked at 537 bo/d, their production profile is not significantly above these 2014 wells. In the “Productivity distribution” tab, the cumulative production distribution is shown after a given number of months. If you follow the black curve, you’ll see that about 20% of the wells, with at least 2 years of production history, produced more than 150 kbo over that time frame. The average was 109.7 kbo, as is shown below the graph. Note that I’ve preselected the “Eagle Ford” and “Austin Chalk” formations in the Formation selection. On Friday I plan to publish a new post on the Permian, followed by an update on North Dakota on Wednesday next week. Texas RRC. Now individual well production data is estimated from a range of data sources, including regular well tests that measure actual well production (oil, gas & water). Can you explain why your DUC well count seems to be different from all other organization that tracks DUC activity? EIA? DI? IHS? Navport? Most of the companies I have listed above have very similar numbers, yours however seems significantly lower. The DUC numbers I show here for Texas are indeed incomplete. Wells are currently included once they are assigned to a specific lease. In my next Texas updates, I will add pending production and well data (for wells not yet assigned to a lease). For the Eagle Ford, that will raise the number of DUCs with ~150. My well data is mostly based on very detailed well completion reports (W2-forms). However, there are sometimes delays in the way the RRC receives, or processes these reports. Therefore my DUC data will still be somewhat incomplete after this change. In the future I also plan to add other data sources to reduce this gap.